How do I skip certain profiles/companies? The easiest way to exclude people and companies you do not want to target is to tag them manually. This will require you to click on one profile at a time and add a tag under Dux-Soup tricks box. Once you add the tag, it will be saved on the system automatically. Once all the unwanted profiles have been tagged, head over to Options in Dux-Soup and click on ‘Skipping’ tab. Add the tag that you’ve just used. Let’s say you have already closed the deal with a company and you in the future you want to avoid contacting anyone in that company. You can auto-tag profiles which saves you a lot of time as you don’t have to visit each profile manually. 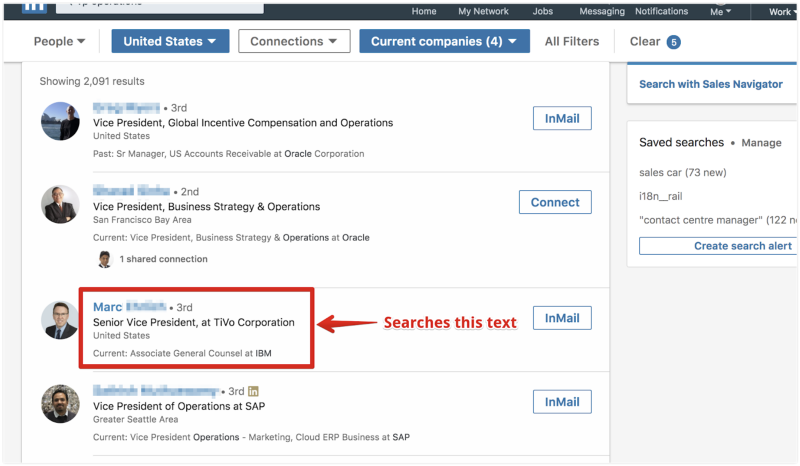 Start by performing a new search on LinkedIn, enter the company name you want to avoid and filter the contacts. This will bring you a list of all the people working at that company. What you need to do next is go to Dux-Soup Options and Automated Actions. Enter a tag of your choice next to ‘Tag profiles as…” , e.g. ‘Client’, and close this tab. Go back to your search results on LinkedIn and click on “Visit Profiles” on Dux-Soup drop-down menu. Dux-Soup will auto-visit and tag every profile saving a lot of precious time for you. 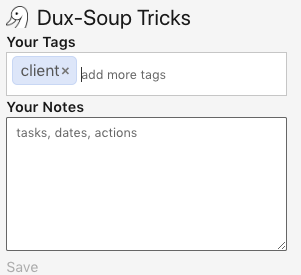 Once all the unwanted profiles have been tagged, head over to Options in Dux-Soup and click on ‘Skipping’ tab and add the tag that you’ve just used (same process as was discussed in the first point: Manual Tagging). The next time you are visiting profiles, Dux-Soup will skip all the tagged profiles and they will not be sent any message or connection request.